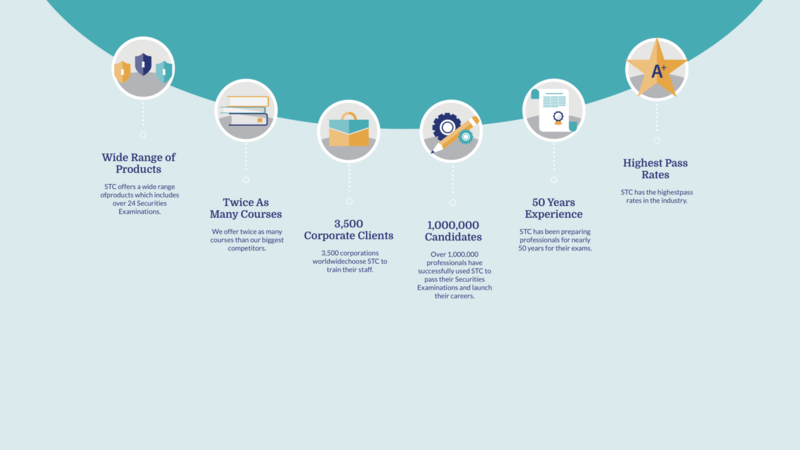 Founded in 1969, STC was created to meet the training needs of the securities industry. Now, 50 years later, our commitment to keeping abreast of the latest technology and hiring only quality people has made STC the most innovative and sought after training company across the financial services industry. Our People. Our Products. Our Pride. STC is not like any other financial training company. We think we've created the perfect combination of quality service, innovative products and superior content that allows us to stay ahead of other financial services training providers. In addition to offering the widest variety of study options available, STC offers live and virtual classes, and On-Demand lectures puts students in control of their training experience. Our Study Manual is available in both an online and printed format, so each student can review material whenever, wherever. Plus, our mobile app (for iOS) lets students conveniently sync with their STCI homeroom from their mobile device. With insurance pre-licensing solutions available in all 50 states, STC can customize Annual Compliance Meetings and develop Firm Element and Regulatory Element training materials to meet all CE requirements.